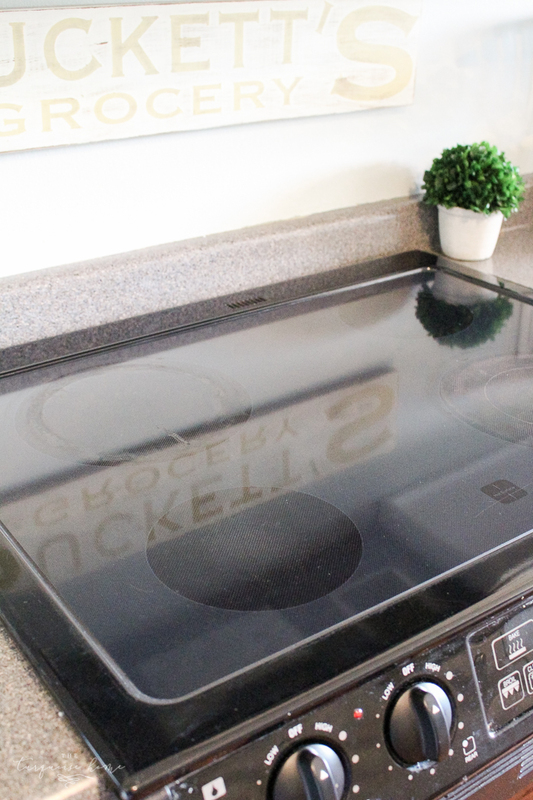 This DIY Non-Toxic Glass Stove Top Cleaner is simply 3 ingredients that you most likely have sitting around in your house. Best news is that you won’t have to smell any nasty, toxic fumes while cleaning. And it works great to leave your stop top sparkling! A few week ago I went to clean my glass stove top and decided to snap a few pictures and document the super exciting process for you. I know it’s what you’re looking forward to tackling this weekend: a little elbow grease over the stop top. Whoop! We live on the wild side, right? I have a secret ingredient in my home that helps me out with a lot of cleaning chores. 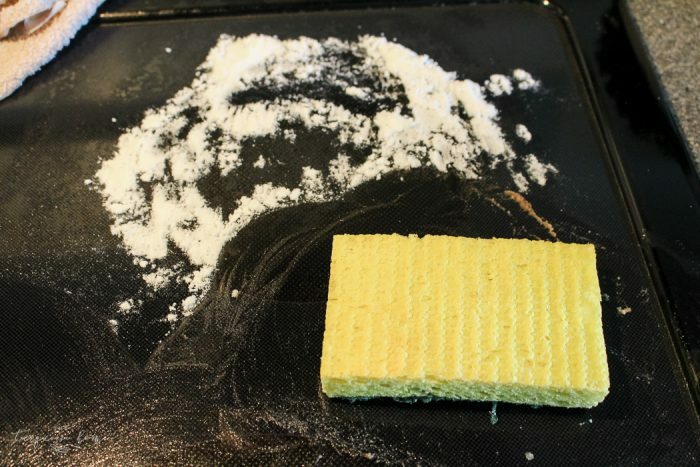 You may be able to guess what it is if you have read my Do-it-yourself Soft Scrub post. That stuff is awesome for cleaning my white ceramic sink and my bathroom! Seriously, I would be lost without my toxin-free soft scrub. So, my glass stove top gets nasty very quickly. Anytime I’m boiling chicken or boiling potatoes for mashed potatoes, the water spills over and cooks on to the stove top. Not pretty! I have a quick little concoction that I throw together that helps me clean up the stubborn mess. It’s not perfect. I sometimes will have to get out my razor blade and scrape off the really stuck-on mess, but usually this mixture does the trick! This is going to be a really hard recipe. Are you ready with a pencil and paper to write it down? Ok great. Here goes. 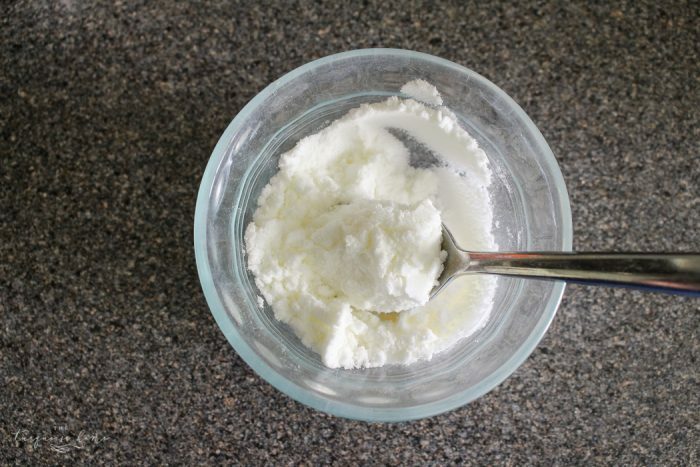 You just mix the ingredients together in a glass container to make a paste-like substance. Go easy on the water and mix until paste-y. The benefit of the Citrus Fresh essential oil is that is a natural degreaser, not to mention it smells fabulous! Then spread it around the cooked on mess on the stop top. Depending on how bad the stains are, I’ll put a damp rag over the baking soda. Scrub mixture into the stove top and watch those stains disappear! I’ll be honest, that in the after picture you can still see a ring around the top left eye. But, it’s much better than the before pic, which is hard to portray in photos sometimes. But in person it was light years better. Also, like I mentioned before, use a razor blade if the stains are especially cooked on. 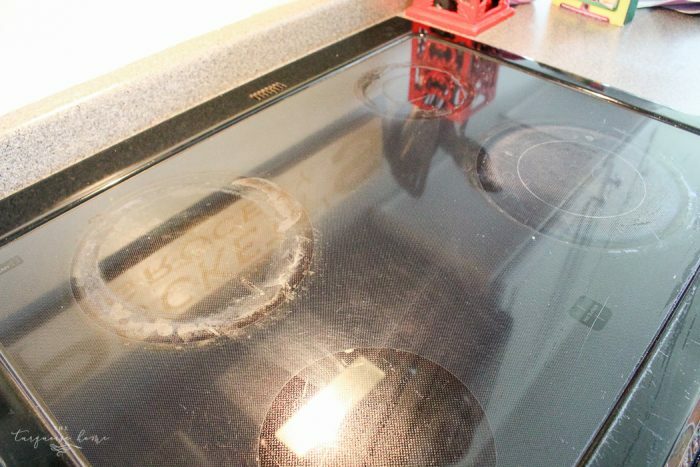 Enjoy your new sparkling, clean stove top! I generally use vinegar, but I cant stand the smell. 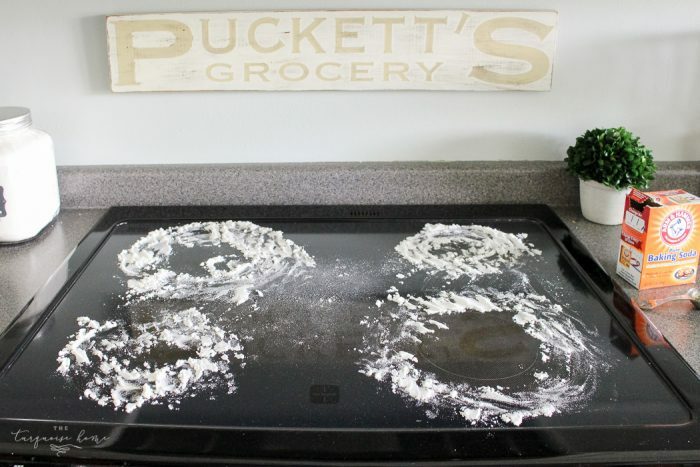 I’m definitely trying this next time I clean the stove top. Hi, Laura! I went right out to the kitchen and tried this out. I don’t have Citrus Fresh oil, so I substituted Lemon since I knew that’s a degreaser, too. It smells great, is kind to your hands, and it does the job beautifully. My stove top is sparkling! I also thought I’d give it a try on a little stainless steel oil pitcher that I keep next to the stove. It had a yucky dust and oil buildup on it that won’t come off just by wiping with a dishcloth. The stove top cleaner took it right off. Made me very happy! Pinning and sharing this post. Thanks so much! Oh yay!! 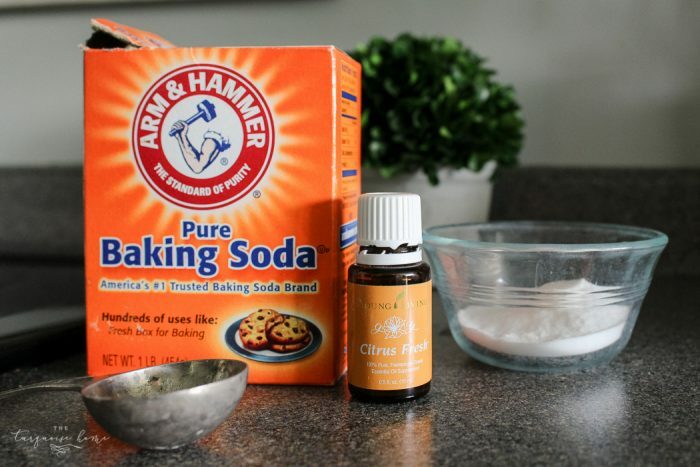 Love a good DIY cleaner, right? And lemon totally works, too! 🙂 Thanks so much for pinning!! stove is Scrubbing Bubbles bathroom cleaner! Just spray it on and let it sit for 3 or 4 minutes and then I just scrub it off with one of the little green scrubbing pads. Most of the burned part just starts melting off as soon as you spray it. I’ve been spraying/wiping with a mixture of water & vinegar for a quick cleaning..but I need something for scrubbing and I’m looking forward to trying this!! Thanks!! Thanks so much Laura! Such an easy recipe with items I already have in my house. I have tried so many store bought cleaners and not found anything that works. Can’t wait to try this out and also use the razor blade. I have been scared to use this tool but will definitely try this out on your recommendation. Thanks so much! This looks wonderfully easy to make and cheap too! I recently started using an electric stove (my old house had a gas stove) so I will be pinning this to use soon.